In recent weeks we’ve announced a number of new products and an incredibly important new service called August Access that focuses on making it simple and secure for our customers, their family, friends, and guests to gain access inside the home. 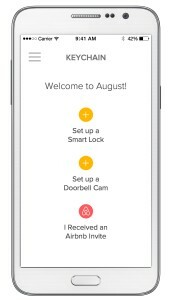 Today we’re thrilled to announce that August is part of Airbnb’s just announced Host Assist program, making it easy for hosts to give guests secure, keyless access to their listing using the August Smart Lock and the August app. August is the best integrated smart lock for your Airbnb service. Hosts simply link their Airbnb account to their August account inside the August app to start the process, which is going live today in Apple and Google app stores. Once a reservation has been made on the Airbnb site, guests will receive an email that directs them to download the August app (if they don’t already have it) and once an account is created, they’ll select, “I received an Airbnb invite”, and link their Airbnb and August accounts and will immediately receive an electronic key for the dates of their stay. If a guest already has the August app installed, they’ll need to link their Airbnb and August accounts one time inside the August app. To do so, on the home screen go to TOP LEFT MENU ICON-->AUGUST WORKS WITH. The name of their reservation location will appear on the main August app screen automatically after the two accounts have been linked. Hosts do not need to deal with delayed flights or waiting for guests to give them keys. Hosts have complete control over who has access to their home. Upon connecting their Airbnb and August accounts a host can authorize specific August Smart Lock(s) that the guest will have access to during their stay. 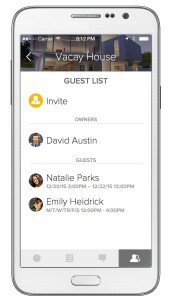 Hosts can view all upcoming guests in the Guest View of the August app. Once the reservation ends, access to the Host property will be automatically ended. Guests do not have to worry about finding a key or the friend of the Host waiting to give them access to the property. Upon connecting their Airbnb and August account, a guest will automatically be assigned a virtual key that will activate as soon as the reservation begins. Any changes or cancellations will automatically change the access times/days and be reflected inside the August app. 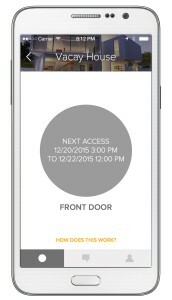 Guests can access the property at any time using the August app. Once the reservation ends, access to the property will be automatically ended. The updated August app for iOS and Android is NOW available in the Apple and Google app stores. To get started as a host or guest using Airbnb and August, open the August app and select TOP LEFT MENU ICON-->AUGUST WORKS WITH.